Orders open on November 9. 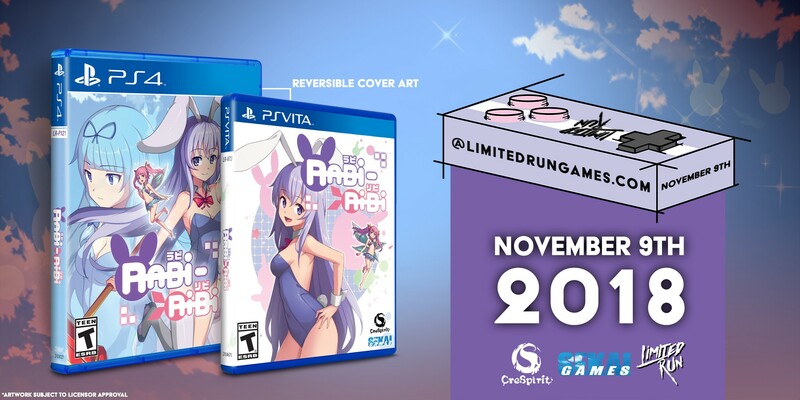 Limited Run Games will release a limited run physical edition of CreSpirit’s 2D side-scrolling exploration platformer Rabi-Ribi for PlayStation 4 and PS Vita via the Limited Run Games online store on November 9 for $29.99, the distributor announced. Rabi-Ribi first launched for PC via Steam in January 2016, followed by PlayStation 4 and PS Vita via the PlayStation Store in September 2017 in Europe and October in North America. In Europe, PQube also released a standard physical edition of the PlayStation 4 version. Erina’s humdrum life as a regular rabbit is turned upside-down when she finds herself in an unknown world and turned into a human! Along the way she meets the cheerful pink-haired fairy, Ribbon, who mysteriously chooses to stay by Erina’s side. These unwitting heroes embark together on their quest to restore Erina’s life to normalcy, but who knows what troubles are waiting for them. Rabi-Ribi is a 2D exploration platformer that focuses on non-linear gameplay. You play as our protagonist Erina, who focuses on close quarters combat. Ribbon the fairy is the ranged attacker who follows Erina’s lead. Can you survive the bullet hell boss battles? Can Erina turn back to being a bunny?! With over 40 boss battles, over 50 upgrades to your moveset and secret game modes, Rabi-Ribi is the most adorably dangerous game you’ll experience in a long time! Four-plus difficulty settings for all types of players. Nine-plus main areas and 20+ sub-areas to explore. 40-plus boss battles and 1,000-plus attack patterns with Boss Rush Mode to fight some or all of them in a row. Post-game story and content with speedrun mode which takes out every section of the game where the player cannot control the main character. Over 50 pieces from an original soundtrack. English, Chinese, and Japanese support.